Lovelyz, Woolim Entertainment's first girl group, visited Singapore to hold their concert - Lovelyz 3 of Winter World! Debuting in November 2014, the group is made up of eight members - Baby Soul, Jiae, Jisoo, Mijoo, Kei, Jin, Sujung and Yein. The girls expressed that they were excited to be on our sunny shores for the first time! Decked in all-white outfits reminiscent of angels, the members started off with their opening number 'Lost N Found'. They then proceeded to their first ment, asking Lovelinus to sing along if they know the songs! The eight charming girls continued sweeping fans off their feet with cheerful dance tracks 'Bebe' and 'Joyland', before slowing things down with ballads 'Rewind' and 'First Snow'. It was time for the girls to head backstage and prepare for their next segment. While they did, Lovelinus were entertained with an ASMR VCR of half the members - Soojung, Kei, Baby Soul and Yein preparing food in silence. The hilarious VCR had the fans filling the hall with laughter; it was clear how much they adore the girls! Much to everyone's anticipation, the members appeared onstage again with brighter outfits. They continued hyping up the mood with lively tracks 'Cameo' and 'Wowz! ', performing their perfectly executed choreographies. After the performances, the group was asked to rate their comeback - Jiae gave a full 5 out of 5 stars, while Kei felt that there could be room for improvement and gave a 3 out of 5. 'Like U' and 'Emotion' were the next two songs performed! Lovelyz also showed potential variety sides of themselves by 'warning' fans to forget their silly get-ups in the ASMR video; and with Mijoo praising their own English skills "our English very very good"! We look forward to seeing the group on more variety shows! Not forgetting to interact with Lovelinus, they invited them to stand up for the next track 'Dear U', where lucky fans even caught the presents they threw! '1cm' also saw party streamers being strewn on the audience, lifting the mood more than ever. Jiae, Jisoo, Mijoo and Jin were the remaining members to appear in the second half of their ASMR video, sending everyone into laughter once again! All members came out again with a fresh set of outfits; performing upbeat songs from 'Destiny' and 'Daydream' to soothing ballads 'Shooting Star' and 'Fallin''. "We're towards the end of the concert. Unbelievable!" Mijoo exclaimed adorably. After performing their last four tracks 'Ah Choo', 'Hi', 'That Day' and finally 'Now, We', Lovelinus could be heard shouting for more as they chanted 'encore' enthusiastically. Hearing their fans' wishes, the girls appeared once again and performed their encore track 'Twinkle'. The pretty members spoke their ending ment one by one; where a cake was even brought out for birthday girl Kei! To top off their surprise, a VCR made by fans was played on screen; where it touched the girls to tears. 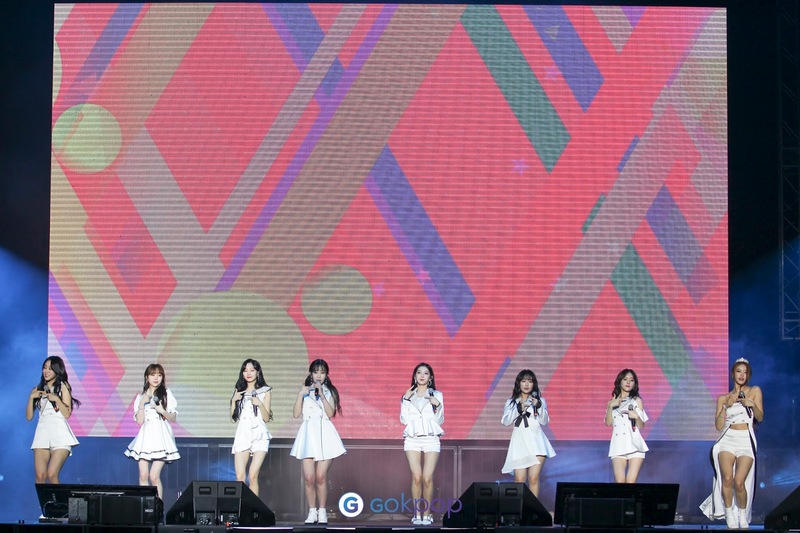 Lovelyz concluded the concert with 'Good Night Like Yesterday' - filled precious moments of the girls trying to finish the song in tears. All in all, Lovelinus had the time of their lives with the group, and we're sure they're already waiting for the next chance to meet the girls again! We would like to thank IME Entertainment for the invitation.